So here's the second tape I dug out from these guys. A mix of Live and Studio stuff from '88 mostly by the looks. Inside info includes this statement: 'this cassette chronicles Animalypse from its conception as a three piece up to and including the earlier performances with Day Boy'. Beautifully crafted wacky, strung out Dunedin pop, smacking of the Clean / Great Unwashed on speed (or the wrong speed if you think in turntable terms) in this instance. I would say 3Ds too but interestingly they pre-date 3Ds first release by two years. There's probably more of a leaning towards the Expressway sound overall & I can hear Sferic Experiments' crazed anti-pop sensibilities in there I'm certain of it....although a lot more structured than that ensemble. Being from that incestuous Dunedin scene, it's hard to know who's distilling who anyway. Sferics were around at pretty much the same time and shared at least one band member I know of. 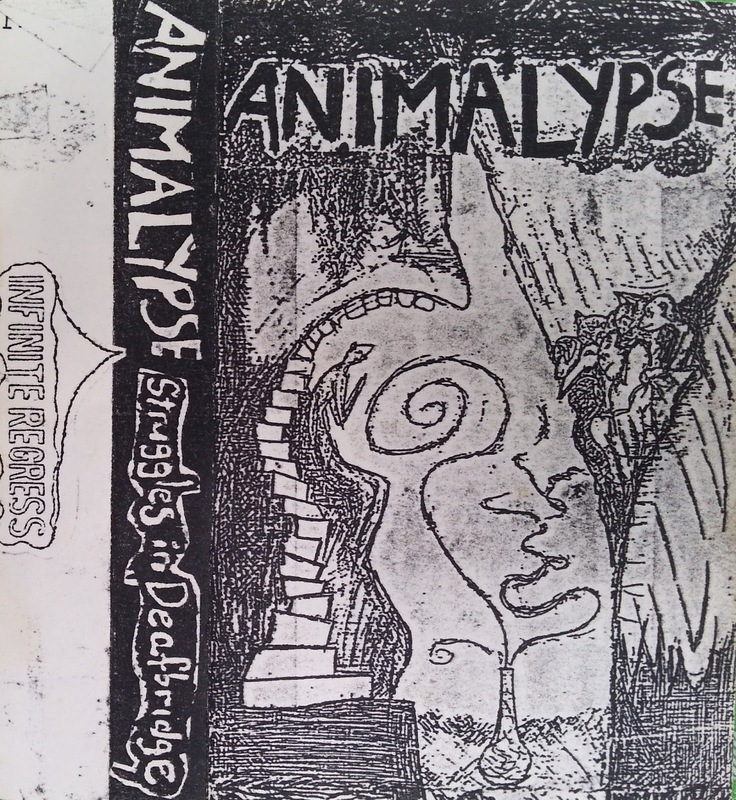 Still, Animalypse are a highly original band that should avoid too many comparisons (it's just easier for hack writers like myself and gives the newcomers references.....and you gold diggers should just be grateful for their existence... they light up our crummy lives). It's a shame some label didn't lock these guys in a studio for a weekend and put out a nice slab of grubbily produced lolly on a small run of vinyl, so all us old timers could have copies. Sux. At least we have these tapes to keep us happy. Also includes a version of the David Lynch song 'Heaven', which would be the first 'rock' version of this I would ever have heard. There was a wave of bands (including the Pixies who sort of made it famous...) who did that early 90's, but then you already know that don't you. And, as with the last tape, there's supposed to be 13 songs but there are actually 14 on here. Who knows what the last track is... or whether the tracks are in order? Frankly, who cares? Just listen and be shocked at what you missed and how these kids blow away the rock monkey crowd these days. Again, ripped with minimal intervention. Only volume balanced for an even listen....don't complain if it's not exactly right. Or my big sister will beat you senseless.